As from the first BEPS proposals with respect to intangibles, it has been considered that the Arm’s Length Standard (“ALS”) is “slowly but surely being relegated to the back seat” of the OECD Guidelines.[1. R. Robillard, BEPS: Is the OECD Now at the Gates of Global Formulary Apportionment?, 43 Intertax 447, at 447.] Indeed, some approaches contended in the OECD “Guidance on Transfer Pricing Aspects of Intangibles”[2. OECD (2014), Guidance on Transfer Pricing Aspects of Intangibles, OECD/G20 Base Erosion and Profit Shifting Project, OECD Publishing.] cannot be explained under the ALS. The effects of such statement cannot be minimized. These approaches suggested by the OECD Guidelines are actually in breach of the treaties to which the Guidelines are intended to apply. One may imagine the example of a Brazilian independent company performing the extraction of poison from snakes, for the sole purpose of producing the respective serum, to supply Brazilian and Bolivian hospitals with such remedy. This example is suggested because one can reasonably assume that such serum is market-oriented, i.e., snakes found in South American forests are not found in other parts of the world and the serum is produced from the poison of the snake which effects the serum is supposed to combat. Under this scenario, one could consider the case in which the Brazilian company would decide to invest on research for substances able to stimulate the production of poison by the snakes, due to an increase of demand in the local market (which is, perhaps, the sole market for such product). For this purpose, as the company would not able to perform the research by itself, it could decide to hire a French laboratory, which would perform all the functions and provide for all the assets related to the research. The Brazilian company would solely fund the research, assuming, on the other hand, the risks related to the failure of the research. 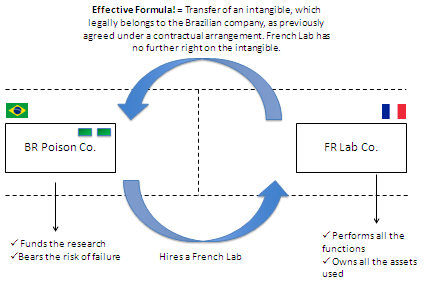 By the end of the research, the French company would reach an effective formula, whose rights would all legally belong to the Brazilian company, as previously agreed under a contractual arrangement. According to the ownership clause in the agreement, the French company would not be entitled to any right derived from the exploitation of the intangible produced. Consider now a similar situation, but this time between parties under common control. In the very same example, if the Brazilian company were the subsidiary of a US-based MNE, it could be possible that the group as a whole would have no interest in developing the referred intangible. Accordingly, as already mentioned above, the serum would be aimed at poison of South American snakes, thus having no worldwide application. In such case, the only option for the subsidiary would be to fund the referred research with its own resources. Within this intent, the company could choose to hire another subsidiary of the group, under the very same conditions described in the uncontrolled example, leading to an ownership of an intangible to the Brazilian subsidiary, in the same conditions as in the previous example. 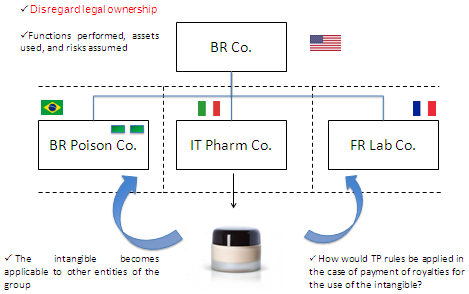 How would these controlled transactions be treated for transfer pricing purposes? Under the ALS, the French subsidiary should be remunerated equally in both examples, if the transactions concerned are identical. However, when applying the approach suggested by the OECD “Guidance on Transfer Pricing Aspects of Intangibles”, there are reasons to believe that the taxation of the transaction could be distinct in each case. “[t]he need to ensure that all members of the MNE group are appropriately compensated for the functions they perform implies that if the legal owner of intangibles is to be entitled ultimately to retain all of the returns derived from exploitation of the intangibles it must perform all of the functions, contribute all assets used and assume all risks related to the development, enhancement, maintenance, protection and exploitation of the intangible”. In other words, if the entity wishes to keep all the rents derived in the future exploitation of the intangible, it must do everything alone. Otherwise, it will always owe something to its related parties. The BEPS proposal also risks to create uncertainty with respect to “unanticipated ex post returns”. In the given example, one may imagine an event where a third party, not related to the MNE, discovers an extremely successful cosmetic application for the poison of the snake. Hence, while, in principle, the intangible developed was of restrict use, solely relevant for the Brazilian and Bolivian local market, this situation changes and an Italian subsidiary of the MNE decides to engage in the production of the cosmetic. This example seems enough to demonstrate that BEPS initiative may be deviating from ALS. This is extremely dangerous, if one considers that this standard is present in almost all treaties in force. One can expect the OECD to be aware of this fact and this explains the reason why the OECD does not clearly declare that the ALS shall not be applied to intangibles. This would be a honest approach, but would certainly not be a practical solution, unless all countries would agree in changing their tax treaties in order to admit an exception to the existing rules present in Article 9 of OECD-MC. The OECD itself does not seem to believe that this consensus could be reached, and therefore the BEPS Action 14 (Multilateral Agreement) does not dare to touch this problem. In face of such circumstance, the OECD found no alternative, other than extending the interpretation of Article 9 (and therefore of the ALS). This would not be the first time in which the OECD, in face of a concrete problem of its Model, decides to change its commentary, under the excuse of mere clarification. Such extensions are hardly acceptable under international law, especially when one takes into account that the OECD claims that modifications of the commentaries should be applied retroactively, under the dynamic approach. One can certainly agree that ALS allows a broad range of valid interpretations, what can be seen by the variety of national transfer pricing rules, all of them claiming to comply with this standard. However, as the example above shows, the BEPS initiative on intangibles seems to go too far and its suggestions have left the ALS aside. No dynamic interpretation can be accepted when a modification in the core of a treaty rule is suggested. The problem of intangibles, as already mentioned, cannot be quantified. What is real is that MNEs presently have profits in jurisdictions where no significant function is performed and no presence in market justifies such results. If this is the problem, one can ask why not to face this specific problem – allocation of profits to low tax jurisdictions – instead of disrespecting all tax treaties in force. It is true that the definition of a low tax jurisdiction is not easy, and several countries, including OECD Member States, have special tax regimes which would attract profits to be deviated thereto. However, this is an issue which can be solved through other actions (Action 6). For instance, Brazil and Portugal renegotiated their tax treaty to exclude from its benefits the Madeira zone, due to the tax regime available therein. Exclusion of benefits and more strict deduction rules for payments to companies under special regimes (even indeductibility) could be a remedy strong enough to combat BEPS through intangibles. The present OECD goes much further, and together with valid BEPS concerns, reaches millions of non tax driven transactions within MNEs, which certainly violates the principle of proportionality, and moreover creates uncertainty for legitimate transactions as well. In any case, it is clear that the solution presented by the BEPS proposal cannot be derived from a correct application of the ALS and can therefore hardly be justified under the principle of equality. As to address a very specific issue (i.e., the use of low tax jurisdictions in the allocation of intangibles), the BEPS solution jeopardizes the entire transfer pricing system. If the proposal, upon delivering large discretion to tax authorities, “may or may not” lead to a fair allocation of tax revenues, one thing is certain: the proposal is surely in breach of the OECD Model Convention.